Below, you see an example of a spiral staircase. 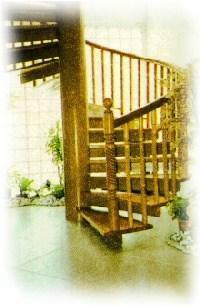 Spiral staircases are inauspicious especially if it faces the main door or is in the centre of the house. 1. It is very unfavourable to have the entrance door facing the staircase. The remedy is to have a screen or partition /divider but not necessary be of full height so long as it can block the view of the staircase from the entrance door. a. Face the main door. b. Located in the middle of the house. c. Must not face a toilet door. d. Must not face another staircase. e. Must not face a bedroom door. f. Preferably the staircase should have 1, 2, 5,10 ,13 14, 17 or 22 steps.